Sisal and cacti on Hope Cay, Chalk Sound. Located at the western end of Chalk Sound National Park, Hope Cay is the largest of the islands inside the protected interior lagoon. Similar to the surrounding land in Chalk Sound, dense low height vegetation covers the island. Much of it is salt resistant, and the poisonous coral sumac is in abundance. The sisal agave is also found on the cay. The sisal plant was raised in the past to produce fibres for rope production, and today can be seen in many terrains in the Caicos Islands. Prickly pear cactus is also common to the cay. 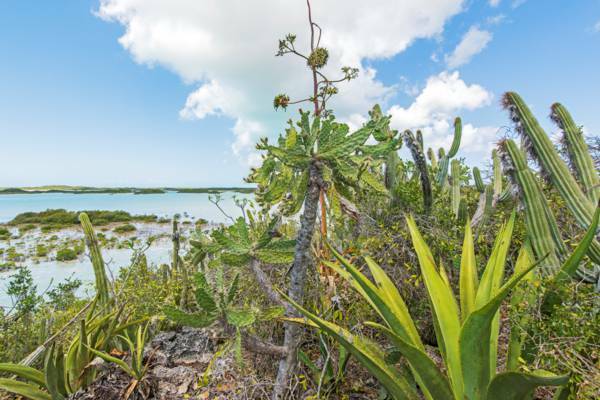 On other cays in Chalk Sound, large numbers of this cactus typically coincide with resident Turks and Caicos Rock Iguana populations, as the iguanas naturally spread the cladodes (the cactus “leaves”) and pears as they feed, resulting in new cactuses. However, there is no evidence of any living iguanas on Hope Cay today. Red mangroves can be found in areas on the west side of the island, and in small sheltered coves. Chalk Sound often exhibits water surface choppiness caused by localized waves, so the west sides of the cays and peninsulas typically support mangrove populations. As is quite common to much of the Chalk Sound region, Karst sinkhole and cave features are seen on Hope Cay. Other than the large underwater cave system at the southwest end of Chalk Sound Lagoon, the Karst features on in the area are limited in depth by the individual island heights. Due to backfill by broken-down limestone and sediment, sinkholes on the Chalk Sound islands rarely reach the current ocean level in depth, regardless of what the initial formation depth may have been at a previous epoch in time. Formed from both Karst processes and typical wave and water erosion, much of the shoreline of Hope Cay features an intricate limestone ironshore surface. Last reviewed by an editor on 10 January 2017.